You are going to love these LEGO Rube Goldberg Machines. They are so much fun to watch! If you have been around for a while, you know that we really, really like LEGO! (If you are new here, welcome!) And, that we are big fans of Rube Goldberg Machines. Since that is the case, we pretty much had to combine the two and share the best machines we could find. Before we get started I do want to point out that these are real Rube Goldberg machines. Many of the cool LEGO contraptions out there are not. I may well do a post about the ball contraptions, but this is not that post, because they do not fit the definition. By definition a Rube Goldberg Machine is a very complicated or complex way to complete a simple task. The issue with the ball machine is that they are missing a key element . . . the simple task! So to call them RG machines is simply wrong. They are not. All of the LEGO Rube Goldberg Machines I am sharing with you today do complete a task and are true machines. Just thought I would get that out of that way and make sure people understand the distinction between the two and why I chose the ones featured here. Go here for more wonderful Rube Goldberg Ideas including additional machine videos. Oh boy! This is a rather exciting post to write as these machines are very enjoyable to watch. Maybe you would like to make your own?! Well, I can guarantee you will get a lot of super ideas for doing just that by watching through these LEGO Rube Goldberg machine videos. The first video is not great quality and the actual footage of the machine in action goes quite quickly so you will likely have to rewind or run it in slow motion in order to catch everything. However, I included it because they talk about the steps of the machine and you can see it all laid out nicely. I’m pretty sure they must have been using this for a school project. I think the video will give kids (and everyone else!) a good overview of how the process works. This young boy made a chain reaction on a gray baseplate which launched a ball into the bucket. It is a multi-step contraption and he and his family gets very excited when it works. Do watch past that part if you want to see the slow motion version. Using LEGO Technic, this machine video admits that it sometimes takes multiple tries to get it right. I like the use of so many elements in this one. Next up we have some students who built a LEGO machine with an Angry Birds theme. The machine has quite a few LEGO components in it including the ball at the beginning, much of the construction and the wall at the end. This one is a bit longer and has more going on, which means are more places for it to fail as well. After he shows the completed contraption, he also shows the fails. One does have to be patient if they are going to make these because there are so many things that can go wrong. It is highly satisfying, however, when they do work right! Mixing LEGO sets to create this chain reaction was pretty fun. I saw several different sets included such as LEGO City, Star Wars, and Power Miners, plus there are likely more pieces from other sets as well. If you spot another leave a comment! This clever machine is pretty awesome. I love that it is compact, how it is set up to work and the final task delivery is mighty great as well. Overall, he did a wonderful job on it! Disney’s LEGO Death Star chain reaction is a treat to watch! Done in true Disney fashion with great music, an amazing run and some pretty slick replays as well. Totally worth watching a few times! 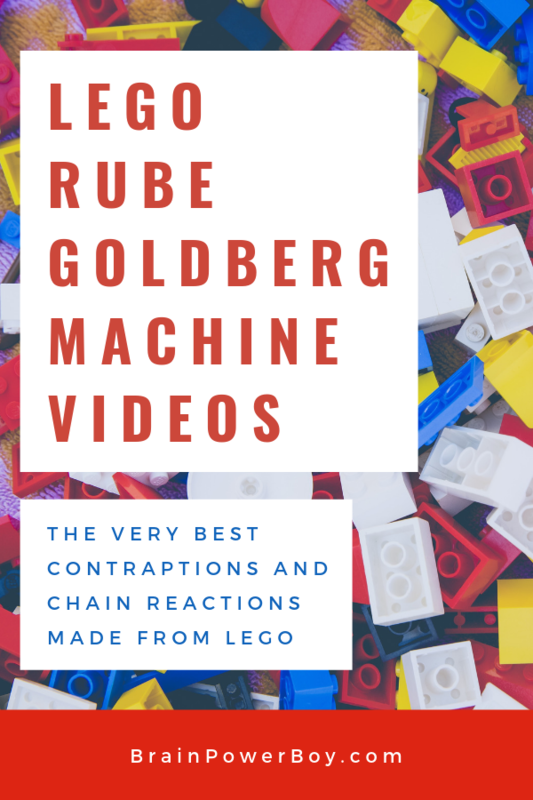 Just in case you would like to make your very own LEGO chain reaction, but don’t know where to start, I am sharing this video on the book – set combination. We own it ourselves. It is really good and worth getting. I am sure you will enjoy it. Klutz LEGO Chain Reactions has 33 cool pieces and elements, 10 modules included as well as some balls and ramps in order for you to make your own device. Plus there is a detailed instruction book. Watch the video to see what you can do! Here is the stuff in the book in action. I can tell you from experience that it is really enjoyable trying to figure out how to get everything to work. If you are buying this for your kids, I guarantee they will be learning while playing! If you are buying it for yourself, enjoy! I know I did. I hope you enjoyed these LEGO Rube Goldberg machines and now know the distinction that makes them true Goldbergs.